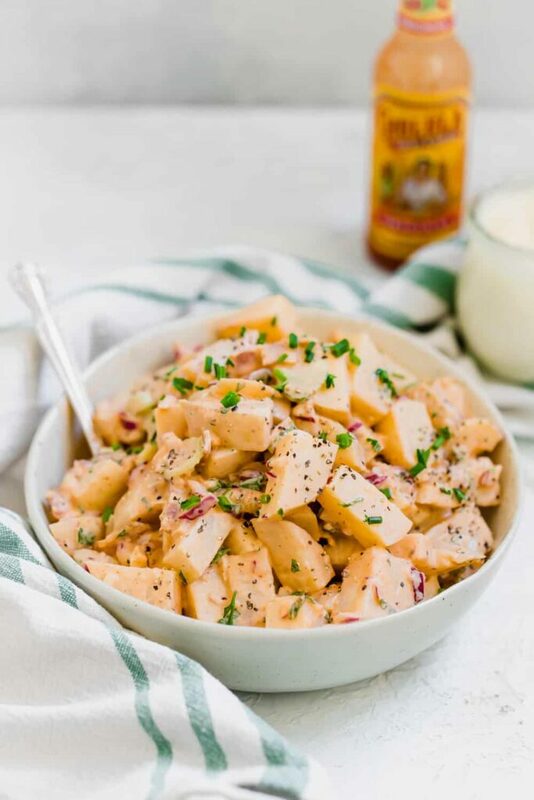 This creamy buffalo paleo potato salad is loaded up with crunchy bacon bits, crispy red onion, and a combination of homemade Whole30 mayo and zesty hot sauce that’ll leave you wanting more. This is the most perfect side dish to enjoy year round! 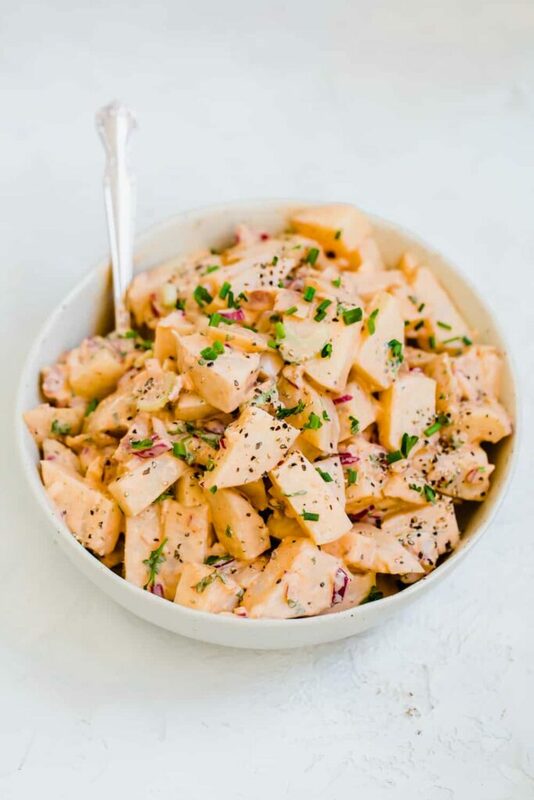 A paleo potato salad for everyone! Potato salad hasn’t always been my jam. It wasn’t until I experimented with making it at home, that I really fell in love with it. Whenever I try store bought potato salad, I’m completely overwhelmed with yucky mayonnaise coating my entire mouth and throat. That’s not a pleasant feeling when said mayonnaise isn’t healthy and delicious like my paleo mayo. The first time I made potato salad, I decided to keep it pretty simple. I added some hardboiled eggs, bacon, red onion and fresh herbs. That recipe made me realize how much potential a homemade potato salad recipe could have. So, I decided to kick things up several notches. Everybody needs and loves having a little hot sauce in their lives, yeah? Why not add it into a potato salad recipe and elevate it completely? Freaking yum. I love having fun with add-ins when making potato salad. I decided to top this salad off with some fresh herbs like chives and parsley. Fresh herbs make all of the difference, trust me. You can absolutely leave the bacon out of this salad if that isn’t your jam. However, it does add a bit of saltiness and umami throughout the salad so you’ll need to go heavier handed with salt if you leave it out. Want to hear something so incredibly real and silly? It took me THREE days to take care of making this recipe, shooting the photography, editing and getting this blog post up. Normally, this is a process that only takes me one day, but things have been taking a little bit longer to come to fruition with our new addition to the family. There are some days where she is happy and content by keeping herself entertained. Other days, she wants to be attached to me at all times. That’s just a challenge I will need to learn how to adjust to. I’m already so excited for the day that Sophie will be able to try all of the food I make! We are going to be exclusively breastfeeding for the first 6 months but are planning to introduce some solid foods at that point. One day, I’ll be able to give her this potato salad, and I absolutely cannot wait to hear the opinion from my sassy daughter. Yes, I called her sassy… yes, she is only 7 weeks old. 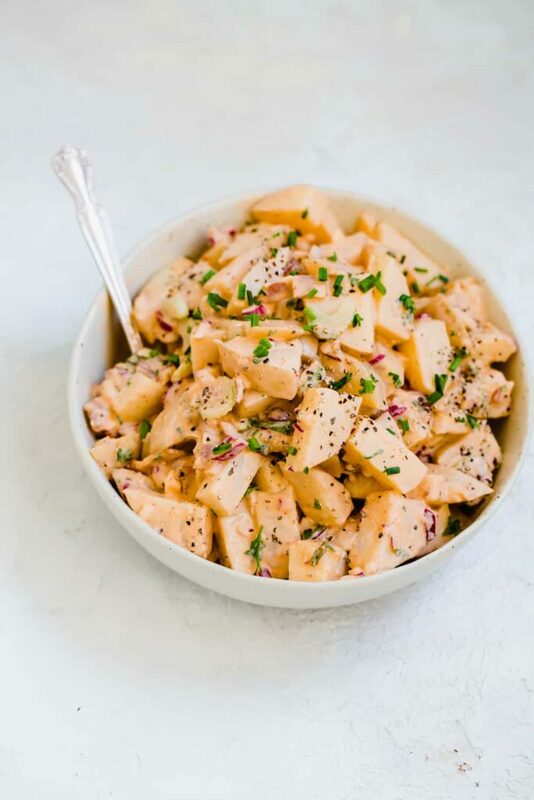 Traditionally, potato salads seem to exclusively been eaten during the summer months. I have never been able to figure out why that is. 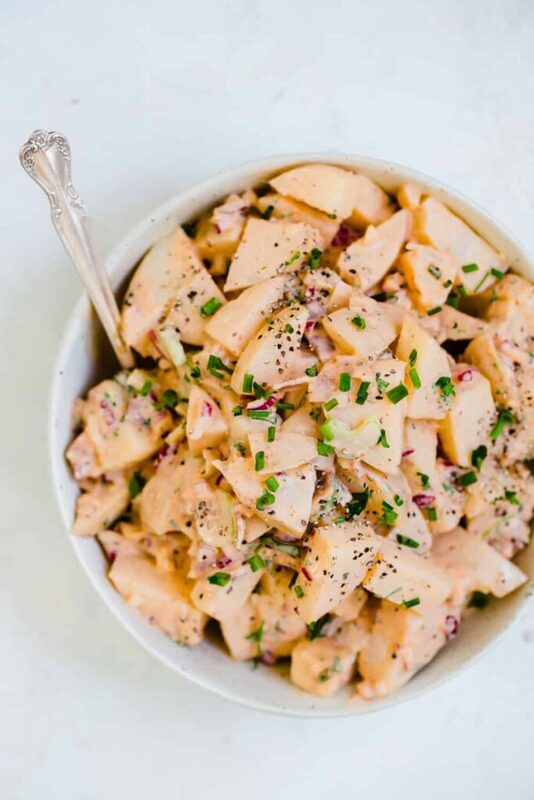 This paleo potato salad is so quick and easy to whip up. It’s just the perfect addition to your weekly meal plan and can really pair well with so many different dishes. Feel free to use any hot sauce you’d like. I had Cholula on hand, so I went to town with it. I’ve heard really wonderful things about Frank’s Red Hot as well. If you’re not into the idea of making your own mayo, you can find some paleo compliant mayonnaise from both Primal Kitchen and Chosen Foods. I really encourage you to make my paleo mayo recipe though. If you have a tall glass jar and an immersion blender, you’re all set equipment wise, and you simply cannot beat the taste! So, it’s settled then. 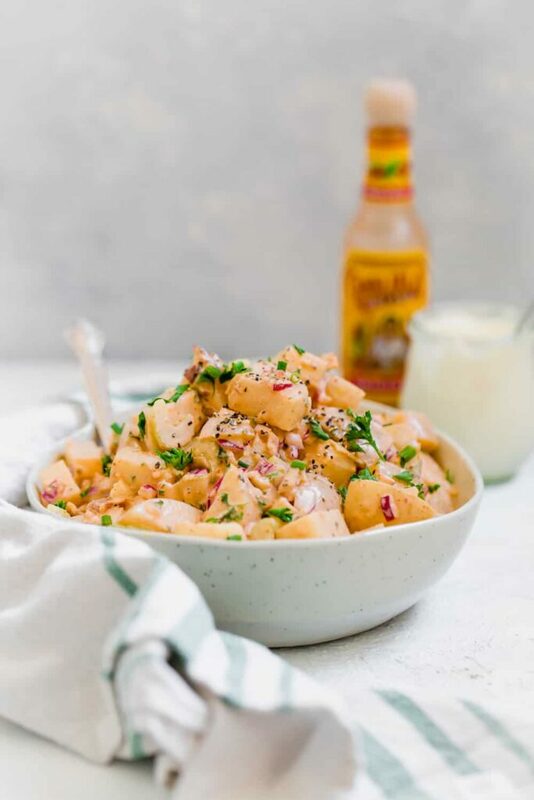 You’re well on your way to throwing a dance party for your tastebuds with paleo potato salad. 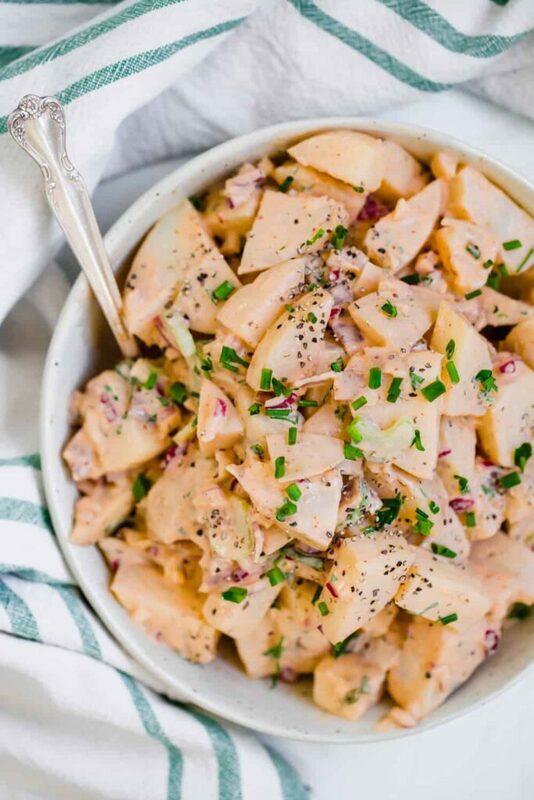 This creamy buffalo paleo potato salad is loaded up with crunchy bacon bits, crispy red onion, and a combination of homemade Whole30 mayo and zesty hot sauce that'll leave you wanting more. This is the most perfect side dish to enjoy year round! Depending on how big your potatoes are, you may need a tablespoon or two more or less of mayonnaise. You want all of the ingredients to be coated well and for the potato salad to appear creamy. In a large saucepan or Dutch oven, cover chopped potatoes with water by 1 inch. Bring to a boil over high heat. Reduce heat to medium-low and cook until potatoes are easily pierced by a fork and you are able to pull out with little resistance. This should take 10-15 minutes. Once the potatoes have cooled, add the rest of the ingredients except for the salt and pepper. Stir to completely coat all of the ingredients. Add sea salt and black pepper, to taste. Serve cold.